In-room kilovoltage (kV) x-ray imaging has become a widely accepted practice for radiother- apy patient setup and target localization. In-room kV imaging refers to radiographic imaging using kV x-ray sources in the radiation treatment room. 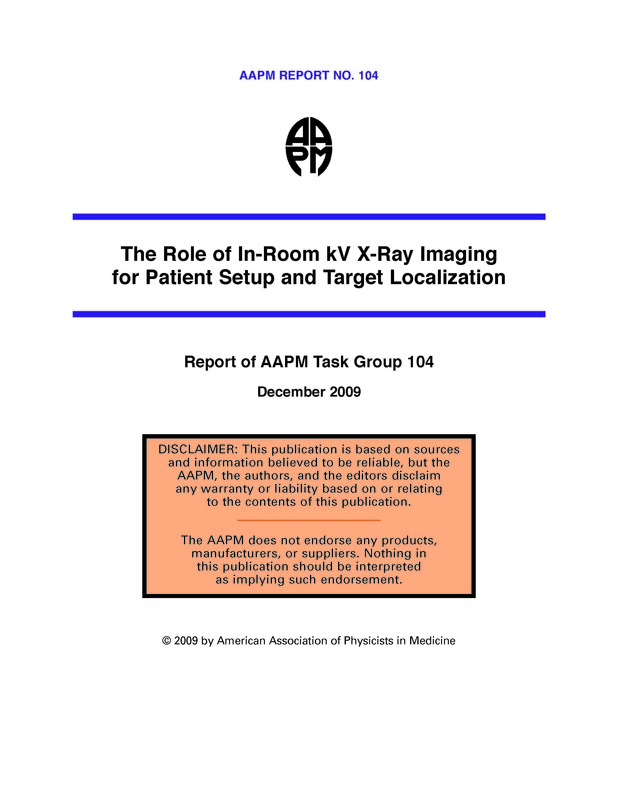 Task Group 104 (TG-104) reports on the various in-room systems that are commercially available using one or more kV imaging modalities. In-room kV imaging systems are divided into three categories: rail-track–mounted systems, ceiling/floor-mounted systems, and gantry-mounted systems. Several distinct systems have been made commercially available, each with unique capabilities, limitations, and levels of operational complexity. A hybrid system is also introduced, which combines two different mounting systems. TG-104 reports on the configurations, specifications, and operational prin- ciples of each of these in-room kV x-ray imaging systems. Methods by which these systems can be used to improve treatment accuracy and their limitations are discussed. The report also pro- vides an overview of the issues related to effective implementation of these systems for routine clinical procedures. General guidance is made for appropriate acceptance testing and quality assurance of these systems for safety, image quality, and data management. The report includes a review of image-guided processes in the clinical setting, and strategies for effective modifica- tion of these processes based on clinical data. Several noteworthy works in progress towards the development of kV- based image guidance are briefly discussed in this report. It is the desire of this Task Group to provide useful information to the radiation therapy community to facili- tate the implementation and operation of high- quality kV x-ray image guidance for radiation therapy.